Background Encouraging healthy lifestyles in children is a challenge. This project aimed to improve lifestyles of younger peers by engaging adolescent creators (ACs) to design and implement peer-led and social marketing (SM) health-promoting activities. Methods A 10-month parallel-cluster randomised controlled school-based pilot study was performed in disadvantaged neighbourhoods in Reus (Spain) spanning two academic years (2015–2016/2016–2017). Eight primary schools (n=375 children) and four high schools (n=94ACs) were randomly placed in the intervention group. The 94 ACs (12–14 years) designed and implemented four SM activities for their younger peers (9–11 years). Eight primary schools (n=327 children) and three high schools (n=98 adolescents) served as the control group and received no intervention. Primary (physical activity and fruit consumption) and secondary outcomes (screen time, vegetables, soft drinks, sweets and fast food consumptions) were assessed with validated questionnaires at baseline and at the end of the study. Results After 10 months, fruit consumption and physical activity were maintained in the children who consumed ≥1 fruit/day and spent ≥6 hours/week physical activity. However, compared with the controls, the intervention significantly increased the physical activity of girls to 15.6 min/week, whereas the percentage of girls who consumed sweets, soft drinks and fast food decreased significantly by 8.4%, 14.5% and 5.9%, respectively. Additionally, the percentage of ≥2 hour/weekday of screen time by boys decreased significantly by 8.2%. Conclusion The European Youth Tackling Obesity-Kids, SM and peer-led intervention, effectively increased physical activity hours/week in girls, but was not effective in improving the percentage of children who consumed the recommended fruit. Moreover, the percentages of girls who consumed sweets, soft drinks and fast food and boys screen time decreased. Trial registration number NCT02702336; Pre-results. Achieving these trends, especially in childhood and adolescents, requires the successful implementation of policies and strategies that promote health to attempt to solve this worldwide problem.12 Because children and adolescents spend most of their time in school,13 14 this setting is ideal for promoting a healthy lifestyle. The present pilot EYTO-Kids project taught in Reus was designed with these approaches to reach a younger population and improve lifestyles before the beginning of adolescence. The activities in this project were designed based on SM strategies and developed by adolescent peers as ACs (first to second grade Spanish high school, aged 12–14 years) for younger peers in primary school education (third to fourth grade in Spanish primary schools, aged 9–11 years)22 as a singularity. The EYTO-Kids project aims to improve lifestyles by engaging ACs to design and implement activities using peer-led and SM criteria to promote healthy choices for their younger school peers. The EYTO-Kids project was a school-based, parallel-cluster randomised controlled pilot study implemented in Reus, Spain. The original protocol has been published previously.22 Children were the unit of analysis, and to minimise the contamination between the research conditions, the schools were the unit of randomisation with an allocation ratio of 1:122 based on a research randomiser software.24 Local authorities identified 20 primary schools serving socioeconomically disadvantaged neighbourhoods, and these, along with eight high schools, were assigned to the intervention or control groups while accounting for the nearness of the intervention and control schools.22 The participant recruitment process began in March 2016 and was finalised in November 2016. A power of 90% was used to detect differences of 5% in the percentages of school children who consumed ≥1 fruit per day or practised ≥4 hour per week of physical activity between the intervention and control groups. An estimated 30% dropout rate was considered because this percentage was observed in the previous EYTO project.19 The required sample size was estimated for each group, and 301 children were placed in the intervention group and 301 children were placed in the control group. Moreover, to assure the implementation of the activities in the intervention schools, 90 adolescents were estimated to be needed, and an estimated 90 adolescents were included in the control group. However, on calculating the design effect of cluster interventions, the sample size increased to 707 young peers/group; therefore, the present study was considered as a pilot study. School children: the children were required to attend the third or fourth grade (Spanish primary school, aged 9–11 years) and belong to one of the schools that participated in the intervention or control group; they must have provided informed consent from their parents or legal guardians and they must have provided personal data, such as names and dates of birth, and answers from their parents or legal guardians to a minimum of two questions in a lifestyle questionnaire at baseline related to both principal outcomes (children’s fruit consumption and physical activity). Adolescents: the adolescents were required to attend the first or second grade (Spanish high school, aged 12–14 years) and belong to one of the randomly selected high schools in the intervention or control group; they must have provided informed consent signed by their parents or legal guardians and the adolescents themselves and they were required to provide personal data, such as names and dates of birth, and self-reported answers to a minimum of two questions in a lifestyle questionnaire at baseline related to both principal outcomes (fruit consumption and physical activity). The lack of any inclusion criteria was an exclusion criterion. The intervention was presented in five stages. A total of 94 ACs from the four intervention high schools were selected by high school teachers and received training in nutrition topics, healthy lifestyles, social marketing principles and tools to communicate healthy messages from health professionals at the Universitat Rovira i Virgili (URV). The ACs at one of the four high schools designed one activity that specifically focused on one of the primary or secondary aims (fruit, vegetables, physical activity practice and sugary drinks and fast food). Each activity was designed according to a common planning guide described in a script format and considering the eight social marketing principles. Figure 1 presents the activities implemented in the primary schools. Activities in the European Youth Tackling Obesity-Kids project designed and implemented by adolescent creators (ACs). The proposal of the four designed activities over two academic years was performed to determine the minimum number of activities necessary to improve the lifestyles of the children while accounting for the fact that the EYTO project has achieved improvements of lifestyles with 10 activities over two academic years. Social marketing principle considerations: (1) customer orientation: aiming the intervention towards younger school peers in primary schools (by the researchers); (2) behaviour: focusing on encouraging healthy lifestyles (by the adolescents); (3) theory: usage of youth involvement strategies in peer-designed sessions (by the researchers); (4) insight: designing activities for the younger school peers by considering the things that children enjoy (by the adolescents); (5) exchange: evaluation of the costs and benefits of healthy lifestyle changes (by the researchers and adolescents); (6) competition: identifying the difficulties of younger school peers in adhering to a healthy lifestyle while considering which stakeholders could be involved in the intervention (by the adolescents); (7) segmentation: selection of the specific population (by the researchers) and (8) methods mix: usage of different methods to transmit healthy lifestyle messages (activities designed as funny games, visual material for support and food product tasting by the adolescents). The 26–32 ACs from each high school presented and shared the activities with the ACs of the other high schools to produce four activities in total. Consequently, all ACs learnt the activities designed by their AC peers and were able to implement four activities for their younger peers. The ACs from the four high school intervention groups followed a standardisation training; thus, each activity was implemented exactly in each primary school. To achieve good standardisation, theatre scripts were written. To implement the four activities (each activity required 1 hour), 26–32 ACs from each of the four high schools were divided into groups of 2–6 ACs to cover all classes in the children’s primary schools and thus affected the high school classes as little as possible. In total, each AC implemented four activities (1 hour/activity). There were two primary outcomes, as follows. (1) The percentage of school children who consumed >1 portion/day of fruit at approximately 150 g/portion,25 which corresponded to half of the international recommendation (a minimum of 400 g/day of fruits and vegetables9). The EnKid Questionnaire26 was used to identify the school children who consumed >1 portion/day of fruit with the question ‘Do you consume a second fruit each day?’ with two possible answers ‘yes’ or ‘no’. (2) The percentage of school children who practised ≥6 hours/week of moderate to vigorous physical activity based on the international recommendations of a minimum of 1 hour/day of physical activity for children, a total of 7 hours/week minimum.8 The AVall Questionnaire27 was used to identify school children who practised ≥6 hours/week of moderate to vigorous physical activity with questions on the number of hours per week they are moderately-to-vigorously physically active in after-school hours, with six possible answers: 0, 1, 2, 3, 4 and ≥5 hours/week. The last two categories (4 hours/week and ≥5 hours/week) were combined in a >4 hours/week physical activity category. Therefore, in addition to the after-school hours asked in the questionnaire, this group included 2 hours of compulsory school physical activity to obtain ≥6 hours/week, the category closest to international recommendations of a minimum of 7 hours/week of physical activity. The children and adolescents in the intervention and control groups completed the survey twice (in the children’s case, the surveys were completed by the parents, and in the adolescents’ case, the surveys were completed by the adolescents themselves) at baseline (March 2016) and at the end of the intervention (December 2016). Continuous variables are represented as the means±SD, and categorical variables are represented as percentages. Generalised linear models were used to analyse the baseline to end of intervention differences in the outcomes in the intervention and control groups. McNemar tests were used to analyse the changes over time in the primary outcomes in the intervention and control groups for the dichotomous categorical variables. For ordinal categorical variables with more than two levels, asymptotic marginal homogeneity tests for ordered data were performed. The principal variables originally collected as continuous variables were also analysed in this way using mixed models of repeated measures. The main analysis was based on the intention-to-treat population (considering all children who answered the survey at baseline), and a sensitivity analysis based on multiple imputation30 was conducted for all variables. A total of 100 data sets with no missing values were generated using the package Multivariate Imputation by Chained Equations31 for the software R V.3.3.332 with the appropriate approach depending on the nature of the variable (based on the logistic regression for the dichotomous variables and predictive mean matching for the continuous outcomes). To allow for comparisons between this study and the previous literature, the main analyses were also stratified by gender. Statistical significance was defined as p<0.05. All analyses were performed using R software V.3.3.3 and SPSS V.23.0 for Windows. Figure 2 presents a flow diagram of the child and adolescent recruitment in the intervention and control groups (March 2016). The schools’ study participation acceptance rate was 80 % (16/20 total schools). A total of 1174 children were recruited and allocated as follows: 375 in the intervention group and 327 in the control group. The children’s average retention rates were 78.9 % (296/375) in the intervention group and 75.8 % (248/327) in the control group. Focusing on the adolescents, the retention rates were 78.6 % (72/94) in the intervention group and 97.9 % (92/98) in the control group (figure 2). Flow diagram of the participants in the European Youth Tackling Obesity-Kids project. The intervention and control group participants included 54.6% (n=205/375) and 47.7% (n=156/327) males, respectively. The ages (mean±SD) of the children and adolescents at baseline were 9.22±0.57 and 13.1±0.59 years, respectively (table 1). At the end of the 10-month study, the percentage of children in the intervention group who consumed ≥1 fruit/day increased by 8% from 45.4% (n=170) to 53.48% (n=200; p=0.025), and no significant difference was observed compared with the control group (table 2). In addition, children in the intervention group showed a significant increase (of 1.2) in the portions of fruit/day (mean (±SD): baseline 1.18 (±0.74) to the end of the intervention 1.3 (±0.71); p=0.015), but this change was not significantly different from the control group (online supplementary file 1). The percentage of children in the intervention group who engaged in ≥6 hours/week of physical activity remained at approximately 70%, but the percentage of boys who engaged in ≥6 hours/week of physical activity in the children’s control group grew by 13.6%, increasing from 69.2% (227) to 79.4% (n=260; p=0.003; table 2). However, engagement in physical activity of ≥6 hour/week was not significantly different between the intervention and control groups (table 2). Additionally, physical activity, analysed as a continuous variable, significantly increased by 0.26 hour/week (15.6 min/week of physical activity) in girls in the intervention group (mean (±SD): baseline 2.5 (±1.29) to the end of the intervention 2.72 (±1.24), p=0.106) compared with the control group (baseline 2.82 (±1.28) to the end of the intervention 2.78 (±1.21), p=0.777) (p=0.050) (online supplementary file 1). 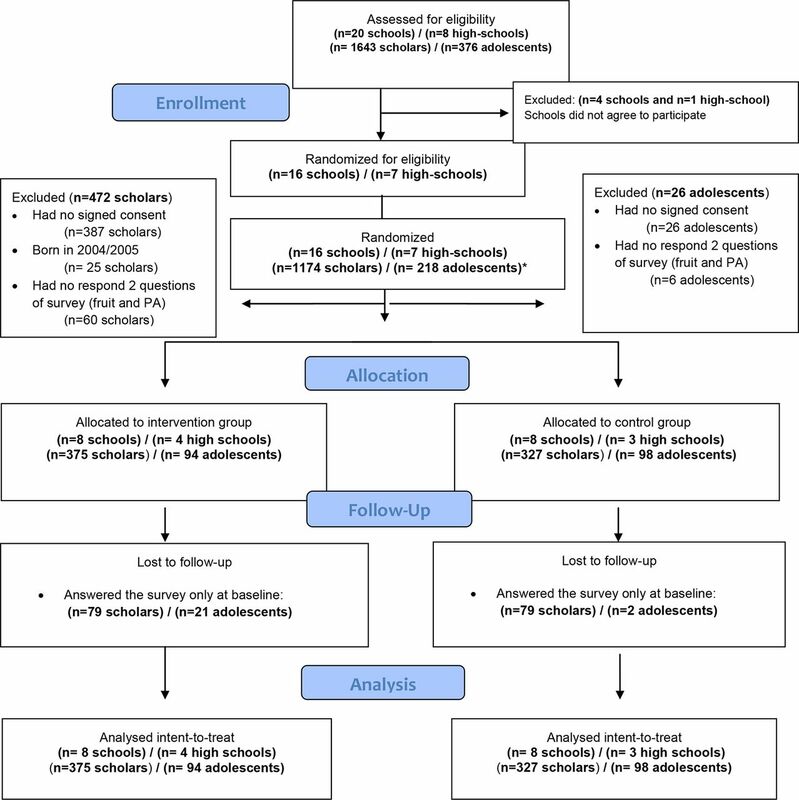 At the end of the 10-month study, the percentage of male children in the intervention group who followed the recommendations of ≤2 hours/weekday of screen time significantly increased by 8.2% compared with the control group (p=0.003; table 2). The percentage of children in the intervention group who did not consume sweets weekly increased by 7.4% compared with the control group (p=0.004). The percentages of girls in the intervention group who did not consume sugary foods and fast foods increased by 14.5% (p=0.044) and 5.9% (p=0.015), respectively, compared with the control group (table 2). Moreover, assessment of the lifestyles of the adolescents who designed and implemented the activities for their younger peers revealed that their lifestyles were unchanged (table 3). At the end of the 10-month intervention, the percentage of male children in the intervention group who did not consume gummy or sweet items/week significantly increased compared with the control group (p=0.038; online supplementary file 2). The EYTO-Kids project is a school-based, adolescent peer-led SM intervention designed to improve children’s school lifestyles by implementing four activities over 10 months and achieved improvements in the number of physical activity hours per week in girls and in some secondary lifestyle outcomes. Consequently, a reduction in the percentage of girls who consumed sweets, soft drinks and fast food daily, and a decrease in the number of boys who had ≥2 hour/weekday of screen time, compared with the control group were achieved. However, the improvements in the percentages of children who consumed ≥1 fruit/day and engaged in ≥6 hours/week of physical activity did not occur. The present study revealed that a greater percentage of children at baseline engaged in physical activity than the percentage detailed in the HBSC report,33 in which only 39% of boys and 28% of girls engaged in ≥6 hours/week of physical activity.34 For these reasons, in the present study, approximately 70% of the children were physically active at baseline, which is interpreted as a challenge. Consequently, the maintenance of 70% physically active children is a milestone, and the improvement of this percentage in the control group children could be explained by external factors not assessed in this study but should be considered in future studies. In addition, an increase in physical activity of 15.6 min/week occurred in the girls in the intervention group, whereas no change was observed in the percentage of girls who engaged in ≥6 hours/week of physical activity (recommended levels of physical activity in children) compared with the control group. Thus, an increase in physical activity hours/week may not lead to an increase in the percentage of children that follow the recommended amount of physical activity. Therefore, lifestyles could be showed in the intervention studies by two methodologies, categorical variables (showing children who accomplish the international recommendations) and in continues variables (hours/week, pieces of fruit, etc). In 2014, Spain reported that 39% of boys and 45% of girls aged 11 years consumed one fruit/day,33 which is much lower than the results obtained in the intervention group in the present study at the end of the intervention (approximately 50%). When evaluating sedentary lifestyles, studies have shown that children between 9 and 11 years spend many hours in front of a screen.41 Specifically, in Spain, 43% of boys and 30% of girls aged 11 years reported ≥2 hours of screen time on weekdays in 2013–2014.33 Furthermore, in a Spanish cross-sectional study with 2000 children aged 6–9 years, the results showed that in 2013, the mean screen time on weekdays was 2.5±1.4 hours/day,34 which is above the global recommendations.8 42 When focusing on screen time as a sedentary behaviour, this study showed an increase in the percentage of boys (intervention group) who followed the recommendation of ≤2 hours of screen time/weekday7 during the study. However, at the end of the EYTO-Kids project, 25% of the children in the intervention group exceeded the screen time recommendations, even after the 8% reduction elicited by this intervention that was not achieved in other peer-led interventions.38 43 An intervention that incorporates greater family presence and involvement could be useful to reinforce the peer-led strategies to achieve a greater decrease in screen time. Although the EYTO-Kids project reduced the number of unhealthy choices, such as the consumption of sweets, fast food and soft drinks and engagement in screen time, healthy choices, such as fruit and vegetable consumption and physical activity, were maintained, which contrasts with the EYTO project results.19 A possible explanation for the difference between the project results is that the five adolescent challenge creators designed and implemented 10 activities for their adolescent peers. Thus, key differences between the studies may be the number of activities (10 in the EYTO and four in the EYTO-Kids) and the target audience (adolescents in the EYTO and children in the EYTO-Kids). The difference in the target audience could affect the lifestyle modification associated with the intervention. Whereas adolescents often make their own lifestyle choices, such as fruit consumption and physical activity participation, these lifestyle decisions in children often reflect their parents’ decisions. With regard to gender, the EYTO-Kids project demonstrated that dietary behaviours, such as the consumption of soft drinks, sweets and fast food, seem to be easily influenced in girls, which suggests that girls more closely meet dietary recommendations than boys, which is in agreement with the HBSC report.33 In contrast, in the EYTO-Kids project, boys were more easily influenced to limit sedentary behaviours, such as screen time, which is also in agreement with the HBSC report.33 This result could be because the girls at baseline behaved in a manner closer to the recommendations.44–46 Surprisingly, although the girls practised less physical activity compared with boys, the present intervention motivated girls to increase their number of physical activity hours/week. The results of this pilot study need to be verified in a larger population. However, a future study should be modified to achieve more effectiveness and generalisability of the obtained results. This methodological modification could include the design of 10 activities over two academic years instead of four activities to identify the number of activities necessary to improve the lifestyles of this specific population. Moreover, the sample size of the target audience should be increased, and parents should be involved in some activities given that their decisions can influence the physical activity and fruit and vegetable consumption of 11-year-olds. 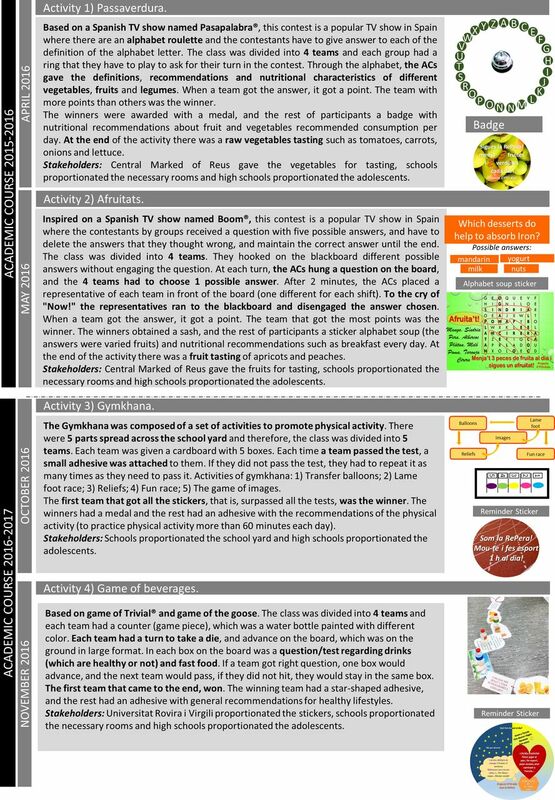 The EYTO-Kids intervention, using four SM and peer-led activities, effectively improved the number of physical activity hours/week in girls, but was not effective in improving the percentage of children who consumed the recommended amount of fruit. Moreover, the percentages of girls who consumed sweets, soft drinks and fast food and boys with ≥2 hours/weekday of screen time decreased. Children may have worsening lifestyles as a result of reduced fruit and vegetable intake, increased consumption of fast food and high-sugar beverages and decreased physical activity, all of which contribute to the global increase in childhood obesity and metabolic diseases. Successful policies and health promotion strategies are needed to reverse this situation. Peer-led strategies and social marketing interventions designed by adolescents for younger school children could be a solution to reverse the global worsening of lifestyle choices among children especially the consumption of sweets and sugary drinks. The implementation of four activities over 10 months by adolescents during school hours had a positive effect on young school children’s lifestyle behaviours (diet and activity choices). This Spanish research project was supported by the Central Market of Reus, Spain (Mercat Central de Reus), which provided fresh food for the intervention. We thank the professors, parents and students of the Reus primary and high schools for their enthusiastic participation in this study.
. Acabar con la obesidad infantil, 2016. ISBN9789243510064. National Physical Activity Plan Alliance. The 2014 United States report card on physical activity for children & youth. Columbia, 2014. World Health Organization. Global recommendations on physical activity for health. Geneva, 2010. World Health Organization. Promoting fruit and vegetable consumption around the world, 2003.
. Social marketing strategies for changing public behavior. New York. In Press, 2002. National Social Marketing Centre. 2010. Social marketing benchmark criteria NSMC.
. REsearch randomizer. https://www.randomizer.org/ (Accessed 9 Jan 2016).
. Health Behaviour in School-aged Children (HBSC) Study Protocol: Background, Methodology and Mandatory Items for the 2009/10 Survey. Edinburgh, 2010.
. Basic ideas of multiple imputation for nonresponse. Surv Methodol 1986;12:37–47.
. Mice: multivariate imputation by chained equations in R. J Stat Softw 2011;45:1–67.
. 2016. R: A language and environment for statistical computing. ISBN 3-900051-07-0.
. Growing up unequal: gender and socioeconomic differences in young people’s health and well-being, 2016. World Health Organization. Global strategy on diet, physical activity and health, 2004:57. Research WCRF/ AI for C. Food, nutrition, physical activity, and the prevention of cancer: a global perspective, 2007. Discover UDS. National Diet and Nutrition Survey. Funded by the department of Health (DH) in England and the UK Food Standards Agency (FSA), 2012. World health organization. WHO urges global action to curtail consumption and health impacts of sugary drinks. 2017 http://www.who.int/mediacentre/news/releases/2016/curtail-sugary-drinks/en/.
. TV watching and computer use in U.S. youth aged 12-15, 2012. NCHS Data Brief 2014:1–8. Contributors LT, ELL, MA-M, MG and RS made substantial contributions to the conception and design or the acquisition of data. All authors were involved in drafting the manuscript or revising it critically for important intellectual content and gave final approval of the version to be published. Each author has participated sufficiently in the work to take public responsibility for appropriate portions of the content and agreed to be accountable for all aspects of the work in ensuring that questions related to the accuracy or integrity of any part of the work are appropriately investigated and resolved. Funding This research project was funded by Obra Social La Caixa, Convocatòria acció social 2015. Reference: AS15-00350//17.980 euros. Patient consent Parental/ guardian consent obtained. Ethics approval The EYTO-Kids project protocol was approved by the Ethics Committee of the University Hospital of Sant Joan de Reus (Ref: 16-01-28/1prog1).